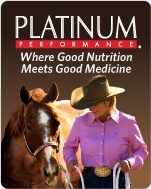 Foundation Equine Wellness and Performance has partnered with Platinum Performance in order to provide you with a source of high quality supplements and nutritional products. You can order their products here and have them shipped directly to you. Simply click on the icon below to access the order page. Platinum Performance provides products for every aspect of health care, both preventative and therapeutic. If you have questions about any product or need advice on choosing a product, call our office at 609/291-0535, or a Platinum Performance Equine Product adviser at 800/688-3229.